Halloween 'Tweet' - Raven Magic! This was a fun way to send out a couple of Magical Ravens. Thanks for the Comments!!! Here is a fun treat. 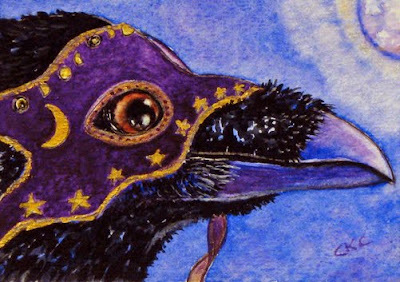 The first two people who leave a comment on this post will receive a free Art Card (2.5" x 3.5") print of my "Moon Magic" Raven painting. This is a great way to add to your collection of ACEO's! I will fly with you soon. The cool crisp days, wood smoke scents and leaf littered garden are signs that winter is not far away. Over the past few weeks, I thoroughly enjoyed painting two sweet rat pups. Rodents have been part of our 'family zoo' during the years Kathryn has grown up. Presently we don't have any rodent pets but we do enjoy the antics of the squirrels and chipmunks in the garden. 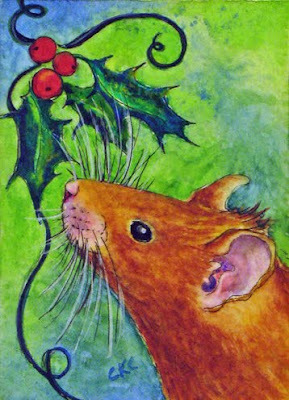 My most recent ACEO is of a sweet little golden mouse investigating a bit of holly. The holly has an artistic design that gives the painting some movement and softens the thorns on the leaves. (I love swirls and spirals.) 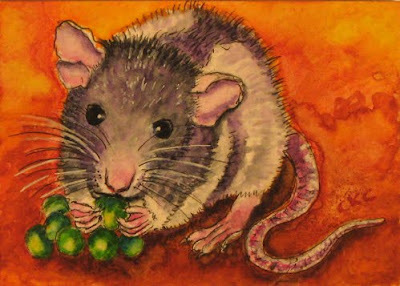 This art card is in memory of our first pet mouse - "Apple". He was a beautiful golden color and his name just seemed to fit him perfectly. He became rather round as he aged! This week I enjoyed painting another baby rat. Over the years our family has raised several wee fuzzy rats to adulthood and they have been wonderful pets. This painting is dedicated to "Ralph" our first little rat pup. When Kathryn was 7, her little pet 'Apple', a lovely golden colored mouse, passed on. I went to the pet shop to purchase another mouse, but at the time they did not have any tame ones. But they did have a clutch of hand raised rat pups. I had never owned a rat and wasn't too sure. But when this sweet Chinese blue hooded pup was put into my hand - I had to take a closer look. He reached up with his tiny paws and took my pinkie and began 'nursing'. That was it - and I think I said something like, "Do you have a box?" Kathryn loved Ralph as we all did. He would follow her everywhere outside and squeak if she got more than a step or two away. He would hop in the grass over to her and climb up... up and up until he was on her shoulder - which was his favorite place to be. This painting includes the brilliant yellows, oranges and reds of autumn and bright green peas (one of Ralph's favorite foods). The background is rather abstract but has elements from some of the local foliage I gathered for inspiration. A couple of weeks ago my brother and his wife, who live very near the Snake River in Idaho, were awaken in the night by "the most blood curdling screaming" they've ever heard, just back in the woods. "It sounded like a woman screaming at the top of her lungs, to the point that I was getting ready to dial 911! Then, I realized what we were hearing: a mountain lion. At times it would become a throaty growl and extremely loud." B.W.C. The next day my brother found the skeletal remains of an adult mule deer that had been completely consumed during the night. Mule deer are large animals - a doe weighs an average of 150 pounds. From tracks it appeared that there were two cats, an adult and juvenille cougar at the feeding site. 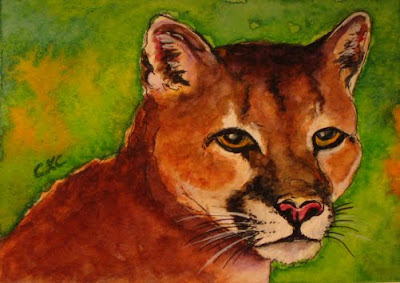 This true story inspired me to paint one of my very favorite wild cats. She's just watching with that intelligent cunning gaze. Cougars bring forth the gifts of power and strength. This week, I enjoyed painting a wee baby rat and her special Halloween stash. Over the years, our family has raised several mice and rats from fuzzies to adults. 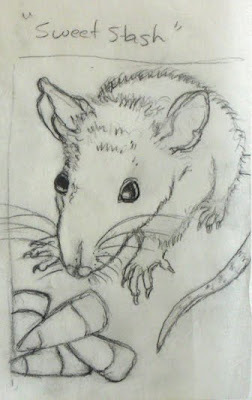 One of my daughter's favorite subjects to write about in elementary school, was her little female rat - 'Peanut' - a true sweetheart. This painting is dedicated to Peanut's memory. 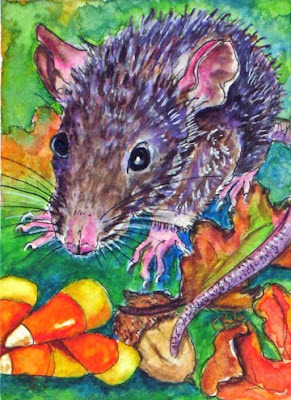 My sketch for this ACEO includes one of my favorite Halloween treats as a child - candy corn! With the addition of the candy, the name of the painting became 'Oh so clear'. Writing down titles as they come to me helps in the process. Sometimes the most challenging aspect of a painting is giving it a title. As this miniature progressed, I needed some fall items for the surroundings. Since we have several 100+ year old white oak trees right out side the front door - I did not go far for inspiration. 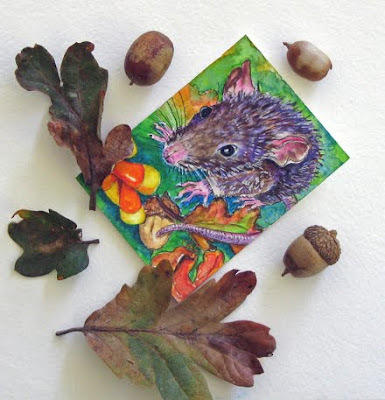 An acorn seemed to be the perfect natural element to add to the little rat's treasure collection. I used a fine golden glitter ink to include a touch of gem quality to the acorn. 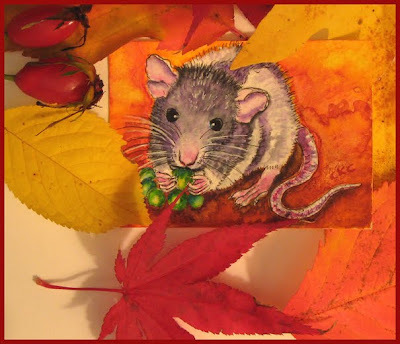 The finished painting shows rich autumn colors and the baby rat seems quite content with her 'sweet stash'. This painting is a sweet price - starting at $0.01!! !